For a birds-eye view of the beauty of the Shawnee National Forest, located in southern Illinois, sign up for a ziplining tour that will have you soaring above the trees. The Shawnee National Forest in southern Illinois is a perfect place for ziplining. The top company operating near there, Shawnee Bluffs Canopy Tour, is located just outside of Makanda and you’ll find two great places to stay nearby—Boars Nest Bed and Breakfast and Blue Sky Vineyard. Shawnee Bluffs Tour Company is Illinois’ first entirely tree-based, eco-friendly zip line canopy tour on 83 wooded acres surrounded by the forest. It offers three-hour trips that will have you soaring above the trees with eight zip lines—the longest stretching more than 1,100 feet—three aerial suspension bridges, and two short ground hikes. 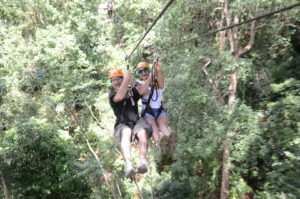 As you zipline, you’ll cross a valley over a bouldered creek four times, reaching speed of 40 miles per hour. The tour is a thrill ride that provides an opportunity to experience the flora, fauna, geology, and history of the area in a whole new and exciting way. For even more of a thrill, sign up for Shawnee Bluffs Night Tour and soar under the stars. For a peaceful country stay, check into Boars’ Nest Bed and Breakfast in nearby Cobden, Illinois. Nestled in the woods along the Shawnee Hills Wine Trail, it offers five cozy cabins. Blue Sky Vineyard, located in Makanda, combines two luxurious bedroom suites with a full winery operation. Explore the beautiful vineyards, then enjoy sampling wines in the stylish tasting room. Both are members of the Illinois Bed and Breakfast Association and offer a unique lodging experience! This entry was posted in Illinois Bed and Breakfasts, Outdoor activities, Touring Illinois and tagged Illinois B&B's, outdoor activities, Shawnee Hills National Forest by admin. Bookmark the permalink.